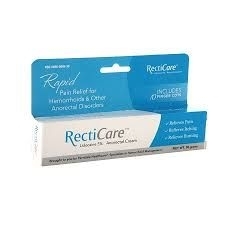 Helps relieve the pain, itching, and burning associated with hemorrhoids and other anorectal disorders. When practical, clean area with mild soap and warm water and rinse thoroughly. Gently dry by patting or blotting with toilet tissue or soft cloth before applying. Adults and children 12 years and older: apply externally to the affected area up to 6 times a day. To use finger cots: Roll one finger cot over finger. Gently squeeze cream onto finger cot. Smooth a layer of the cream over affected area. Do not exceed recommended dosage unless directed by a doctor.